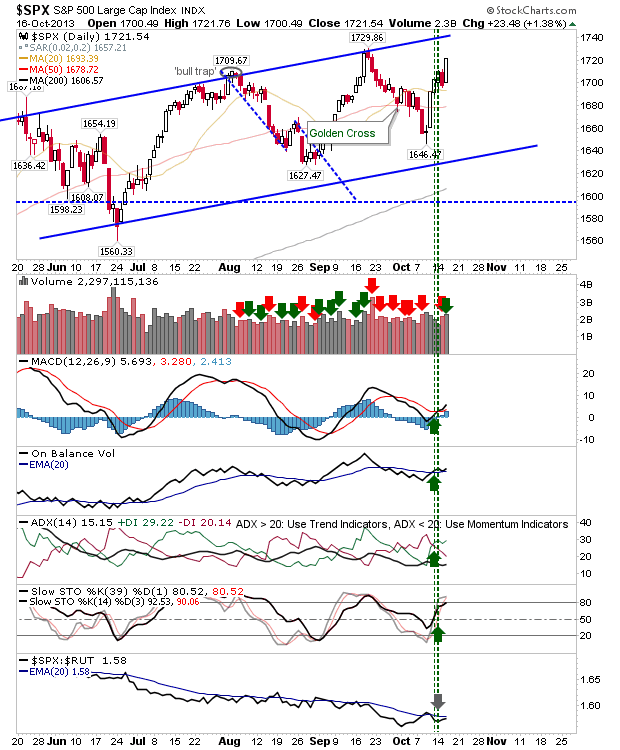 Daily Market Commentary: Deal Struck Now What? So, the can is kicked down the road for another few months and buyers were willing to give the indices another boost. 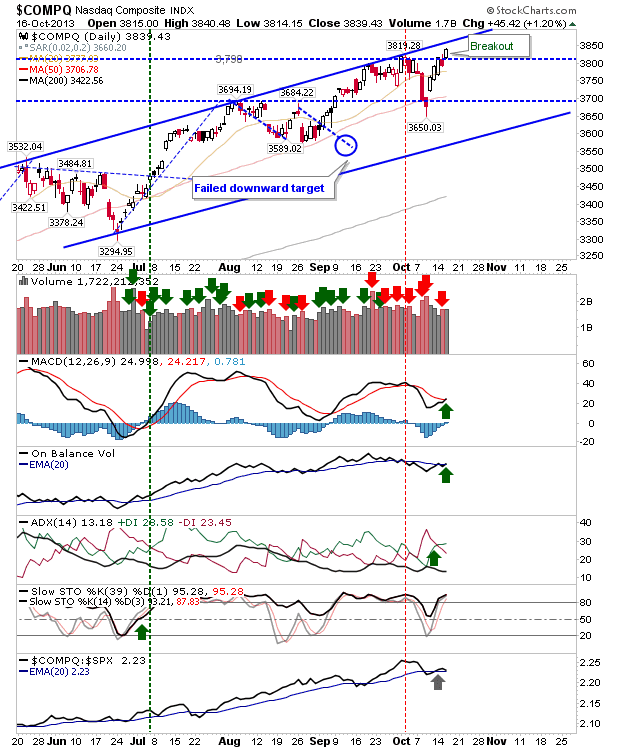 The net effect was to erase much of the bearish creep in supporting technicals of the indices, but it has driven some indices back to resistance. Best of the action belonged to the Russell 2000. The 'bull trap' was negated on yesterday's gain. The MACD trigger 'sell' was revered back to a 'buy', and the index offers plenty of upside room before it gets to channel resistance. Long traders will probably find the most joy here in the near term, with shorts looking for a second 'bull trap' before they have something to work with. The S&P scored the biggest percentage return, although it trades below September's peak. It has underperformed against the Russell 2000 since the summer, but it looks ready to regain a relative leadership roll heading into the latter part of the year. If sellers hit the Russell 2000, expect some monies to be redirected into large caps - boosting this relative performance - giving longs something to work with over a longer time frame. The Nasdaq and Nasdaq 100 are somewhat caught in the middle. Like the Russell 2000, the Nasdaq got a fresh breakout, but it's trading close to channel resistance, which has so far tempered the rate of advance, but crucially, hasn't stopped it. If there is a concern, it's that since the end of September, the heavy volume trade days have all skewed towards distribution: there have been six distribution days since the last accumulation day. Not the kind of action you want to be seeing if you are a bull. With all the bumph over the Debt deal done (for now) there is a bit of a news void to fill. I was surprised not to see a 'sell the news' event, and we may yet see it now as traders look to take profits. 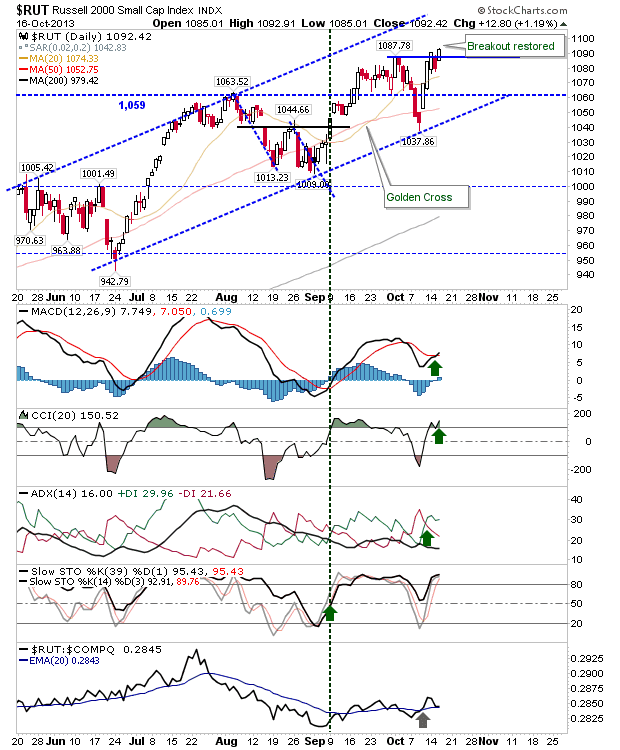 The distribution creep, particularly for Tech indices, is a concern, and with the Nasdaq trading 12% above its 200-day MA it's in far more comfortable selling territory than buying - at least for long term holders. Momentum traders still have the wind at their backs and will be reluctant to call the bull dead yet. The S&P is only 7.2% above its 200-day MA, so there is a little more upside wiggle room before it gets too hot to handle.